Crust enough for two pie shells. Sift together flour & salt, cut in butter, shortening and orange zest until texture of coarse crumbs. In small bowl, mix 6 tablespoons of the orange juice with the sugar and nutmeg. Using a fork, combine the liquid mixture into the flour, stirring to form a soft dough, adding the additional orange juice if necessary. Divide into two balls, cover in plastic wrap and refrigerate for at least one hour. 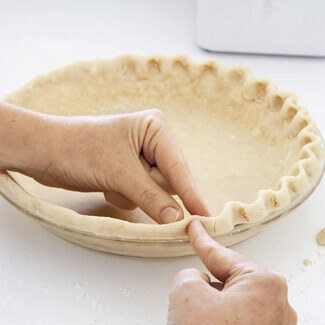 Roll out one of the balls of chilled dough to form a crust and finish into a pie plate.